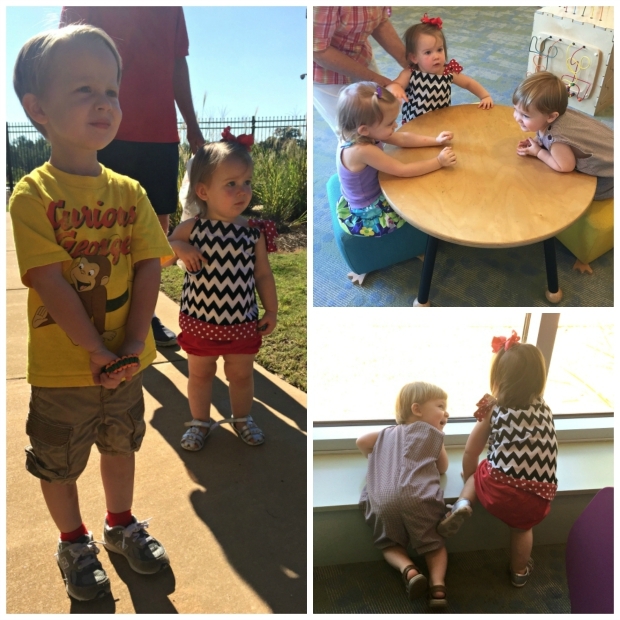 Our weekend started off with one of our favorite fall activities – a football game! I was so hoping for some crisp fall weather to fit the mood, but no such luck. It wasn’t quite sweltering, but it was a wee bit warm for pants and I was regretting rocking the skinny jeans pretty early on... luckily, it cooled down pretty quickly once the sun went down. 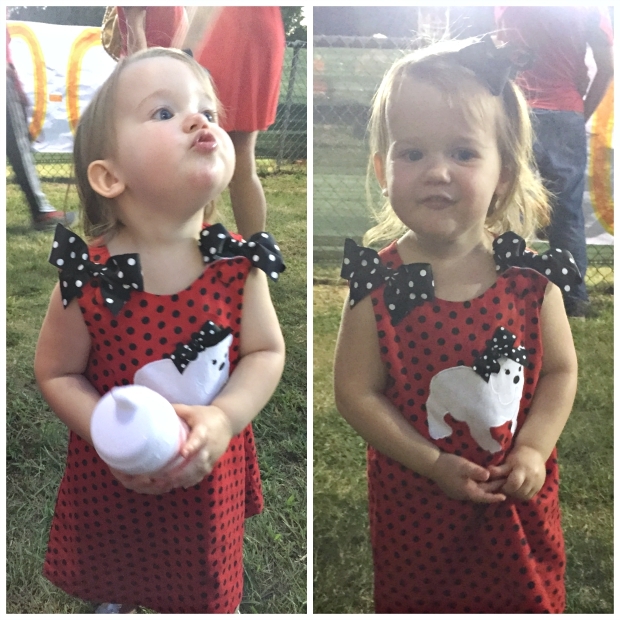 The game was at my alma mater, and since it was homecoming they had a social beforehand with hors d’oeuvres, beer, and wine. Both of the kids have been attending this event every year since they were born, but this year was extra special because Jacob now attends the school as well. It’s still so crazy to me to know that he’s walking the same halls that I once walked, learning in classrooms where I once learned, and playing with the children of my old classmates. Saturday we attended our library’s Book Festival. 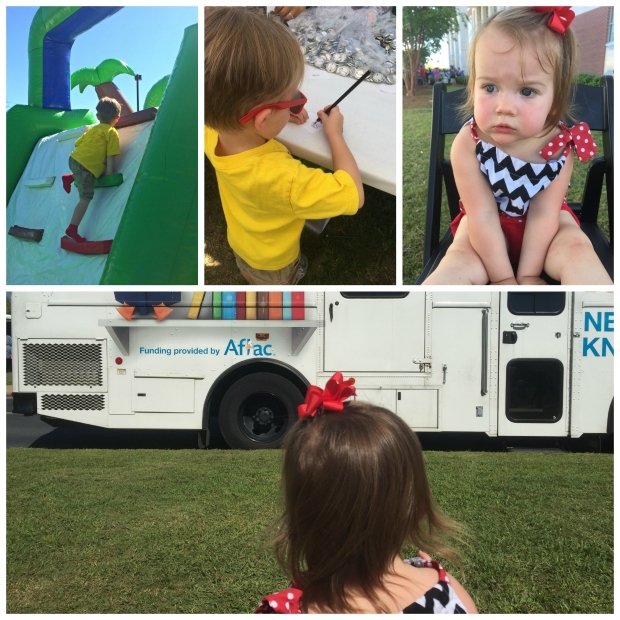 They had several authors and a couple of book characters present plus bouncy houses, arts and crafts, and many other activities for kids. 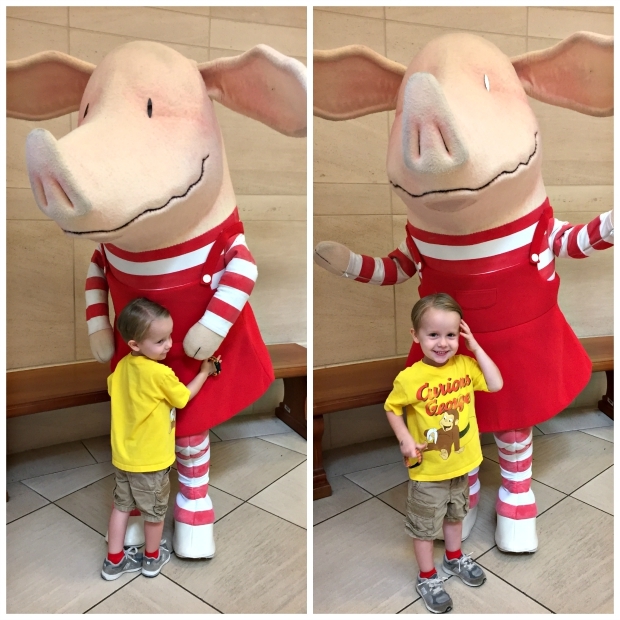 Jacob was excited to meet Olivia from the Olivia books, and my Olivia was, well, unimpressed to say the least. She just wanted to play in the bubbles. 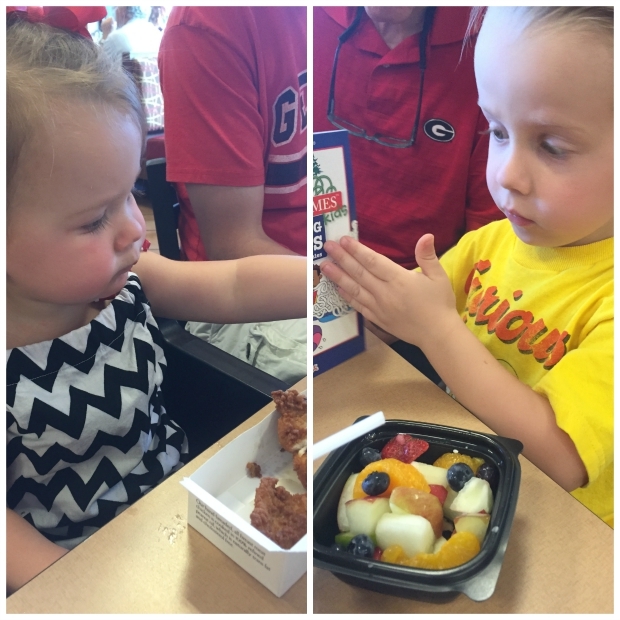 We did a little bit of everything, and by noon, the kids were hot and tired, so we headed to one of the kids’ favorite places for lunch – Chick-Fil-A! Sunday, we took the kids to Panera for lunch followed by a trip to Barnes & Noble, and Olivia refused to take her sunglasses off the entire time. I kept asking her if she wanted to take them off and she would shake her little head very feverishly and say, “Uh uh!” It was so funny. I just adore this little girl so full of personality! I hope everyone has a fantastic week! I’ll be spending the week cleaning out and pricing stuff for our neighborhood yard sale in a couple of weeks, but I’ll be back in a couple of days to share our fall décor. I'm linking up with B Loved Boston for Weekending. Thank you! And yes, Chick-fil-A is the best! What a fun weekend! It is so special that your son is at the same school you were at. That has to mean a lot. Also, the wreath is beautiful. 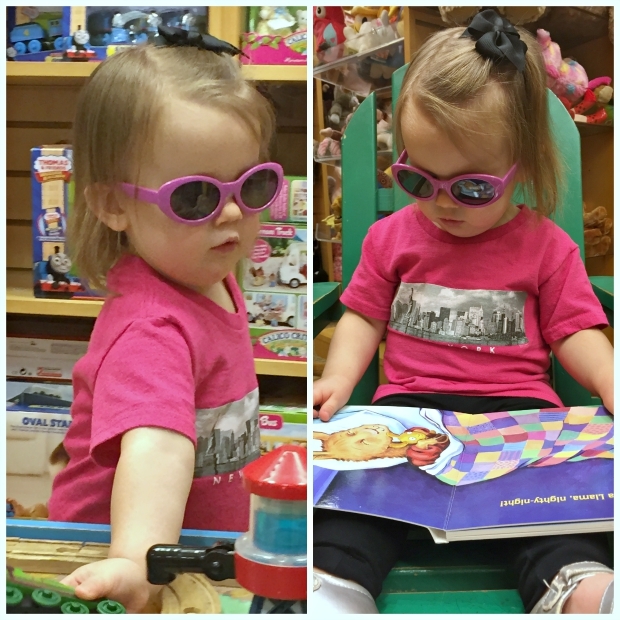 It is just too cute for words about Olivia's sunglasses! LOVE the personality! Thank you! Yes, it's really exciting and comforting to have him there. It's so crazy! It's like all of a sudden just in the last two weeks she's gotten really attached to them. The other night when I was rocking her to sleep she randomly asked for her, "Gasses?" Lol. Thank you! My little festive football darlins! Another great weekend in the books! Olivia looks so glamorous in her sunglasses. I wish I could wear sunglasses indoors...it would save me time (putting on makeup) and money (buying the makeup)! LOL!! !